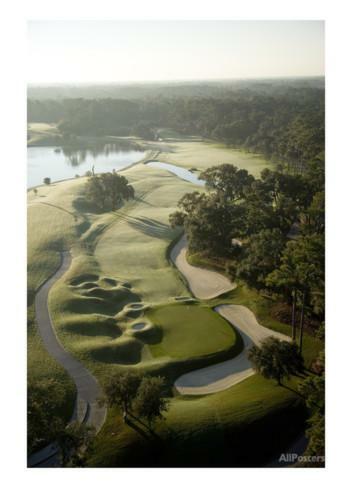 Pete Dye is just one of the most distinct modern day architects. 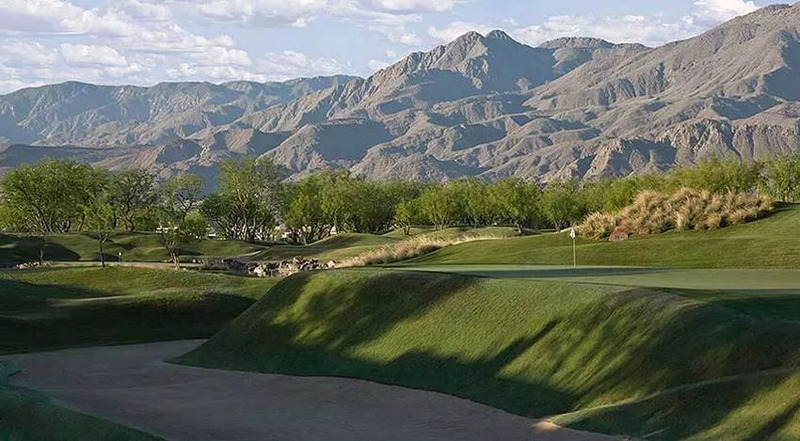 It’s possible to play other courses and know who was the designer based course features, but Pete Dye courses are the most simple to recognize. 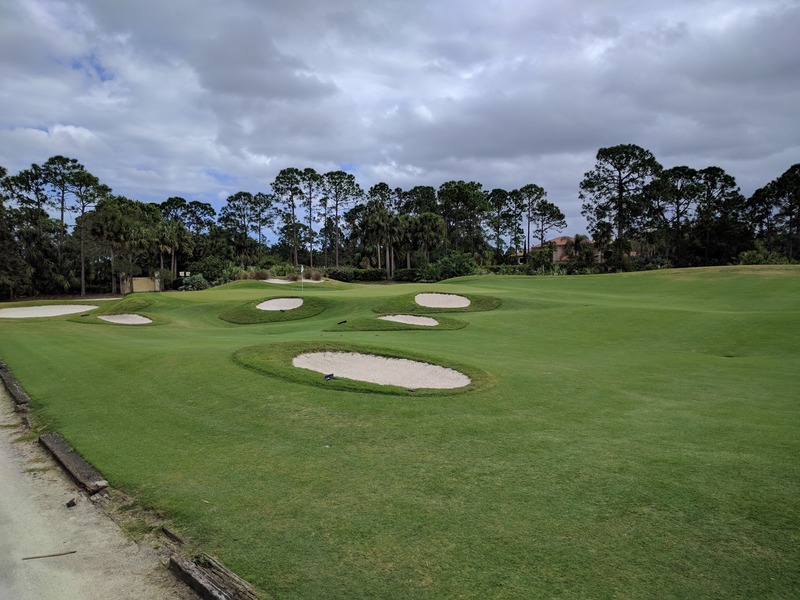 Recently I was in Florida and played a few courses around there. The second to last course I played was the Pete Dye course at PGA Village. During the Instagram story , I started commenting on what to expect from a Pete Dye course because of the obviousness of his design. In the image I posted after that round (below) I mentioned some of those same things and compared him to Pablo Picasso which is somewhat random. Teed it up at the Dye course at PGA Golf Club in Port St. Lucie today. I swear, Pete Dye designed courses are like Picasso art – very distinct, very unique, and easy to know who created the piece just by looking at it. This is the 18th green taken from the fairway, a difficult hole (like tons of final holes are on Dye courses) and a bunch of small bunkers hiding the green from view (another common feature of Dye courses). Because of how easy it is to know you’re playing a Dye course, I figured it would be useful to write down and add some pics of all of the features of a distinct Dye course. Some of the pictures here are mine, and other I found just poking around on the internet. All of them have links back to where I found them, along with who gets credit for the image itself. If you have other pics from Dye courses and want them in this post, hit us up on twitter with them, I’ll post them in here if they’re good and link back to your twitter account as well. Keep in mind here that these things are not the case with every Dye course in existence. Dye’s original courses were different from the most recent ones, and many of the different parts of his courses came about by copying the ideas from designers before him. He has an interesting article here from a book he wrote outlining his design philosophies. One of his first comments about his philosophy is about Radrick Farms course in Ann Arbor, which I played so many times back when I was on Michigan’s team with practice rounds and even a tournament there my freshman year. When I first thought of Dye courses, I knew that Radrick Farms didn’t exactly fit with these current features, and his comment about the course proves that true. 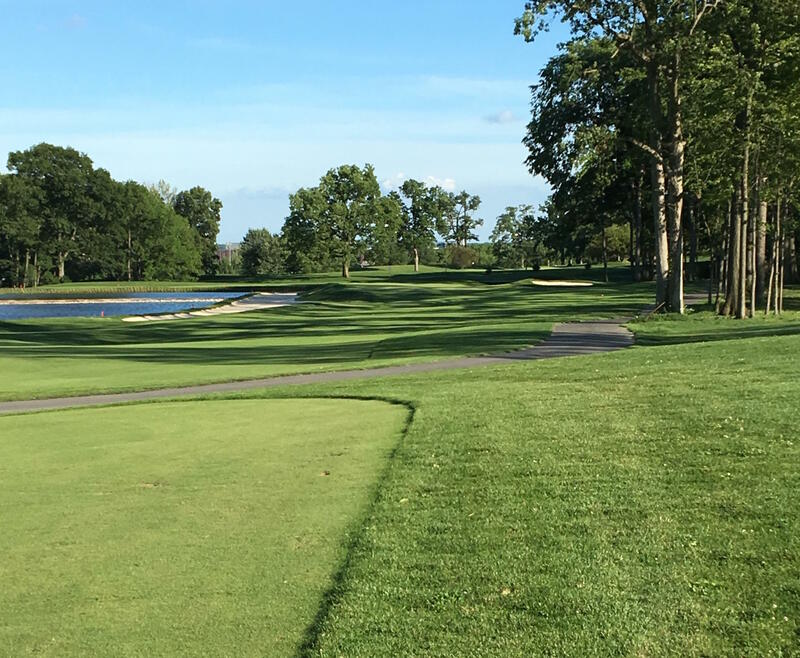 When we began to build our first important course, the one at the University of Michigan in Ann Arbor, we favored the style of Robert Trent Jones, the leading architect of the time. 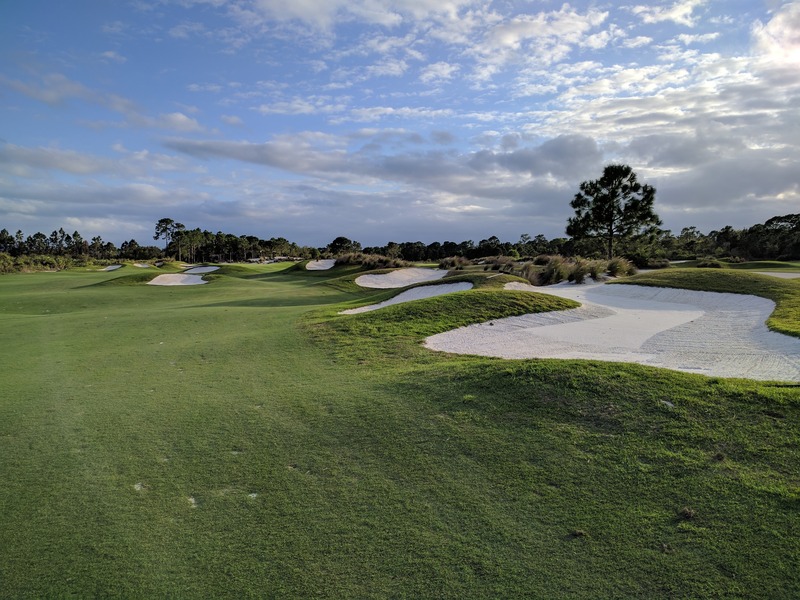 We copied his technique of building long tees and large bunkers alongside big sloping greens at the university’s Radrick Farms course. In another quote from that article he discusses his designs of Crooked Stick where he takes greens from UofM’s main course, an Alister McKenzie design, and uses them on Crooked Stick. Starting with probably the most well known feature on so many Dye courses is him (or his wife) using planks of wood all over his courses. Starting with the 13th hole at Harbour Town Golf Links, and using a quote from his speech, Dye made a comment about the start of him using boards on the bunkers. Going behind all this, I was getting a little back, and my bride was there, Alice was there, and I said, Ally, we’re getting behind and this tournament is coming down the line. I said, there’s a good bulldozer operator named T.P., can you take him over to the 13th hole and do something. So she disappears and goes over there, and I came back three or four days later and here the tees are built and the bunkers are built. And she was smarter than I was, she didn’t use those railroad ties, she put cypress boards outside of the bunker. 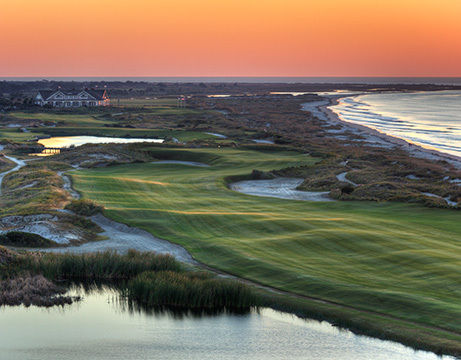 And here’s an image of that 13th hole at Harbour Town Golf Links, by Golf Course Gurus. Considering Harbour Town was one of Dye’s first courses back in 1969, him using boards on the course appear everywhere. Very often in bunkers, but also on greens and fairways as well. Here’s the 11th hole at Whistling Straits, giant bunker in front of the par 5’s green with wood on the face of the bunker. Note the size of that giant greenside bunker, description of that coming later. 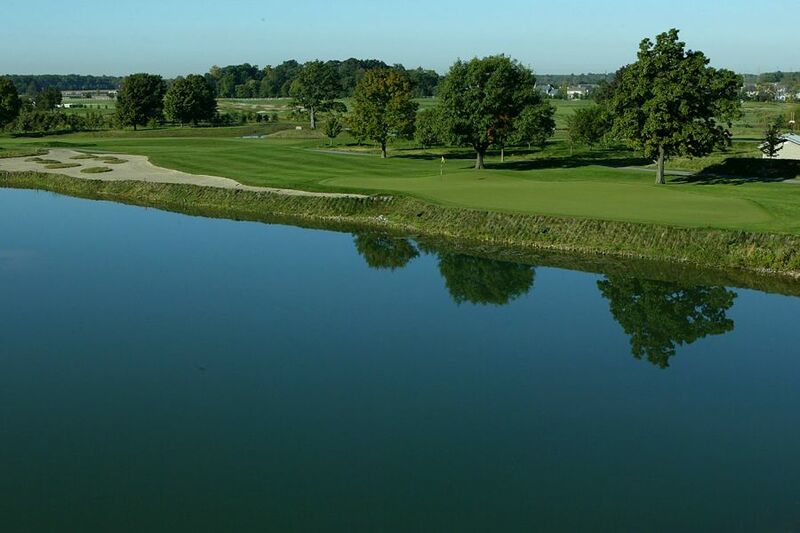 How about the third hole at The Golf Club, New Albany, Ohio? Multiple bunkers, and even space between bunkers is guarded by wood planks. There are plenty more bunkers on basically every course Dye designs, so again, send pics over on Twitter if you have them from your favorite Dye courses. Another big, common feature about Dye courses, that isn’t seen too often with other designers, are long and thin fairway bunkers that are between the fairway and a water hazard to one side of a hole. The idea of these bunkers, first off, is that they look very pretty. And second, they somewhat act as a both a guard for a ball not going in the water if it’s rolling in the direction away from the fairway, and acts as a penalty if the ball is landing just in safety after flying over the water. 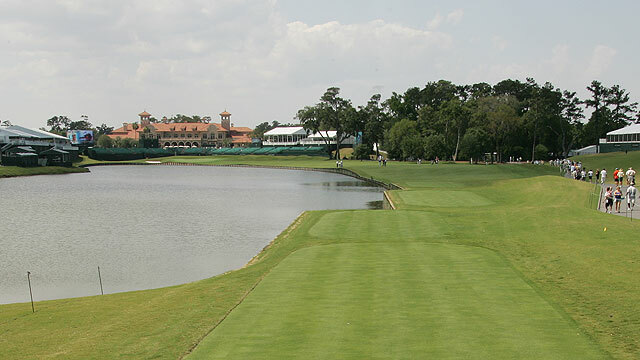 If you want a full example, check out this cartoon-ish yardage guide of TPC Sawgrass. Basically every hole that has a water hazard to one side has a long fairway bunker guarding it. 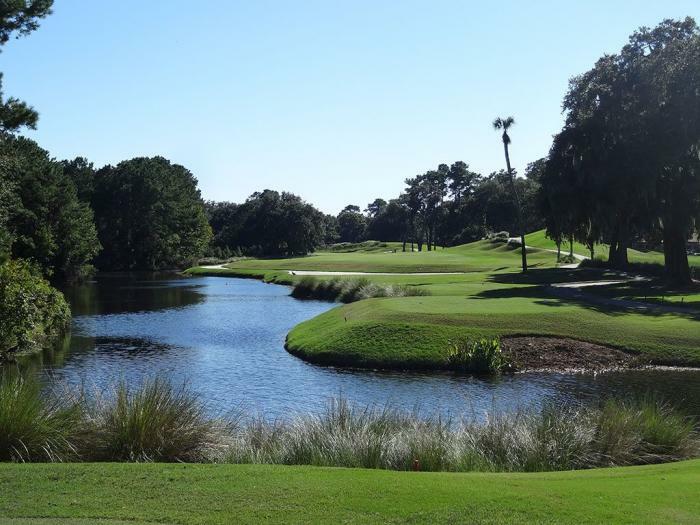 Golf Course Gurus have a couple pics from the course with their overview of Sawgrass as well. and now the green area of the 11th hole, a double dogleg par 5 (something I’ll get into later), which also has a bunker between the grass and water. 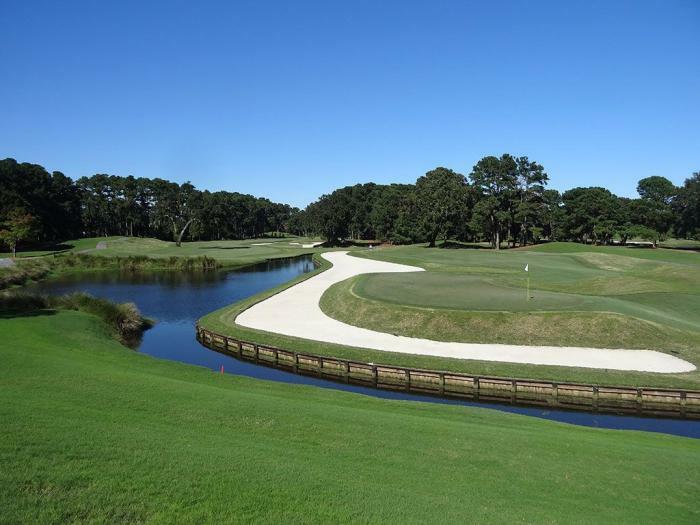 One of the famous holes at Sawgrass that doesn’t have a bunker guarding the water is the 18th, and I’ll discuss the reason for that later as well. Here’s the tee shot on the 3rd hole at the Dye course at PGA Golf Club recently played. Pond to the right, and helpful waste bunker between that lake and the fairway. Granted, this part of the course isn’t exactly a fairway bunker, it’s actually a cart path that that acts as a waste bunker on both sides of the fairway. But guaranteed that Pete Dye was totally happy to change those cart paths to act as bunkers on the sides of fairways. Dye also designed Purdue’s Kampen Course which opened in the late 90s. I remember this course from the Big Ten Championship we played there in 2011, and I remember at the end walking out to our van and saw Pete Dye there, getting into his car that actually had a custom license plate that had “Dye” in it. That entire course was screaming that Dye designed it. This is the green at the second hole, check out the bunker that guards the water until the front part of the green, and then wood planks on the edge. Speaking of Purdue courses, the Pete Dye newly redesigned Ackerman-Allen course in West Lafayette has plenty of Pete Dye features. Here’s the 16th hole, a par 4 with the long bunker next to the green that guards against the pond to the left. 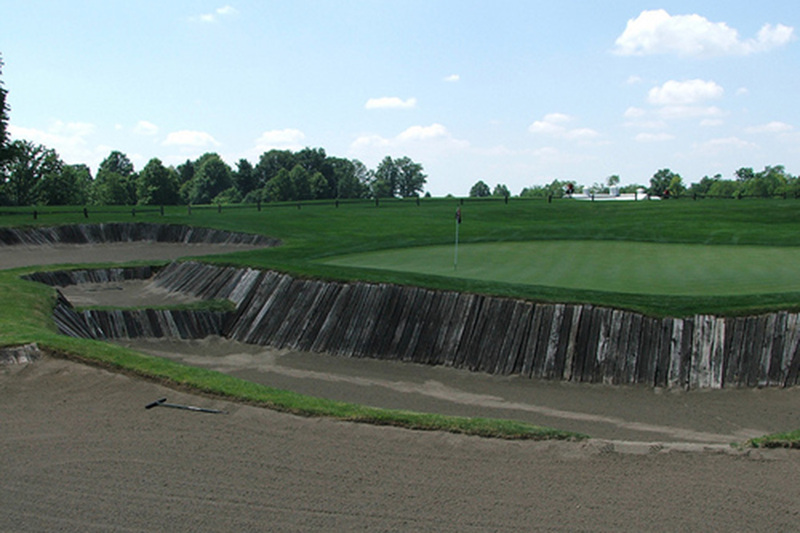 Besides the long fairway style bunkers that guard water hazards, another style of bunkers you’ll see a lot at Pete Dye courses and mini bunkers. Remember that quote at the top of the post about his design at Radrick Farms, and how at first he built “long tees and large bunkers alongside big sloping greens”? More recently built courses don’t have the large, standard looking bunkers that Radrick Farms has, but rather mini bunkers all over the place. These types of mini bunkers exist on his courses both near the green as well as in fairways. Assuming of course there isn’t a lake on one side of the hole with the long and thin bunkers. 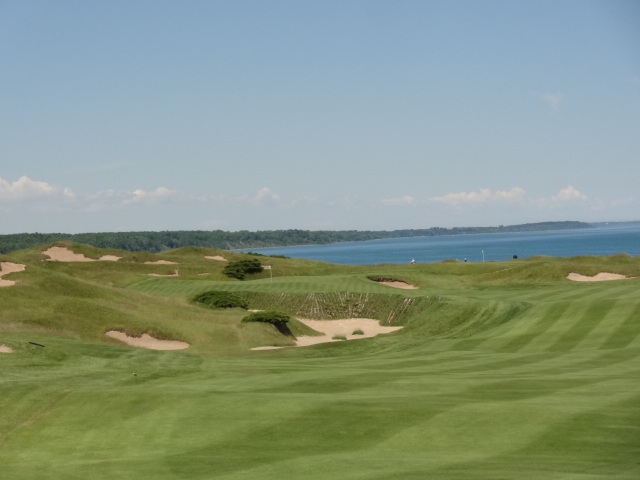 Whistling Straits has to be the main course to mention here, which apparently has 1000 bunkers. Remember the end of the 2010 PGA Championship at Dye designed Whistling Straits where current world number 1 Dustin Johnson put his club in a random bunker next to the 18th fairway in the final round which gave him a 2 shot penalty and lost because of that? That’s a Dye design for you. That being said, time to start with Whistling Straits. This is the tee shot on the par 3 8th hole, somewhat shady, but you can see the mini bunkers everywhere. Though really, if you look up any picture of Whistling Straits you’ll see bunkers everywhere. Check out the 18th of recently played Dye course at PGA Golf Club (again). Another pic from PGA Golf Club, with somewhat comical mini bunkers in this case on the 4th hole. Dye has very specific ones that I’ve already mentioned above, but we have one more to talk about. The final one that you’ll see at a bunch of Pete Dye courses is a large, flat green side bunker with a giant lip guarding the green. Because the lips are so large in these cases, Dye always seems to include a staircase to help you climb out. In this case, Alice gets the credit for those staircases. We do believe in creating some severe greenside bunkers requiring strong lofted shots but there is always a level walking exit place. Alice will not allow bathtub bunkers. First one I remembered was the 11th hole at Meadow Valley. Pretty sure I didn’t hit it in there during that state open at the course, but I remembered the huge lip and made sure I didn’t end up in there with the second shot. Another one from memory, this time from watching it during this past year’s CareerBuilder Challenge out at PGA West, is the 16th hole at the Stadium course there. Finally, another one from Whistling Straits 11th hole. Note the wood used on that bunker as well, and how it’s somewhat far from the green. Makes that bunker shot decently impossible to get up and down. Double dogleg par 5s are defined as a hole where the golfer is forced to aim the tee shot either towards the left or right side of the green, and then the layup is forced to be aimed at the opposite side. This idea actually brings up another big part of Dye courses where on every shot, he makes you decide where exactly to hit the ball In these par 5 cases, either lay up to a specific yardage, or going for the green, no in between. Double dogleg par 5s are perfect examples of this. The 5th hole at Whistling Straights is the first that comes to mind in this grouping, and incidentally, is named “the Snake”. It’s hard to see full par 5s if the picture isn’t from a drone, but from the picture below, you can see the first turn on the bottom left around the bunker, and the second turn is on the right side around the lake and towards the green. 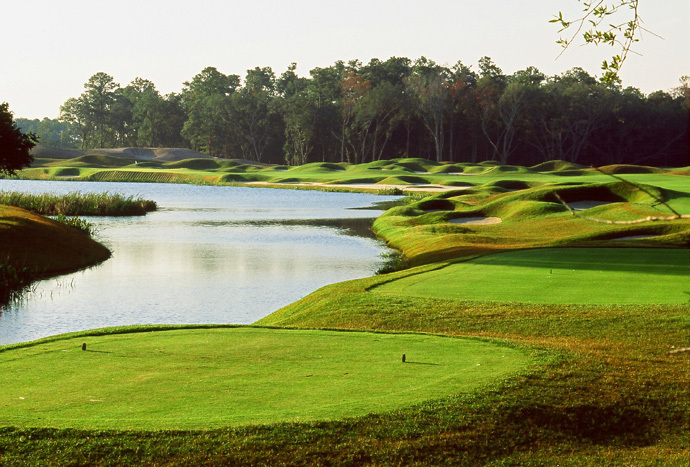 Another that comes to mind right away is the 9th hole at Sawgrass. Though the only picture I was able to find of this hole was by a company that prints the images on posters. So if anyone has a better pic that shows the double dogleg, send it over! But also note the mini bunkers on the right side of the green, and the long bunkers on the left side of the hole that semi-guard against balls rolling left so they stay out of the trees. You can buy the poster here. Two holes down the road is the 11th at Sawgrass, another double dogleg. There’s a picture above in the long bunker section that shows the green of the hole, but here’s a pic that shows the fairway. 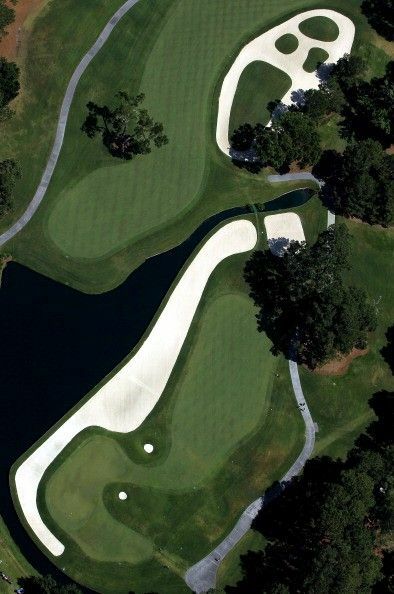 Here’s a cool ariel shot of the hole. You can see the first part of the fairway at the top of the pic angling to the right of the green, and then the second shot, if you’re laying up but over the water, needing to be aimed to the left of the green. That’s the double dogleg here. Final one for now is the 16th at Kiawah Island, another one of the big Dye courses. In case you don’t remember, the course has hosted plenty of big events, mainly though, the Ryder Cup and PGA Championship. 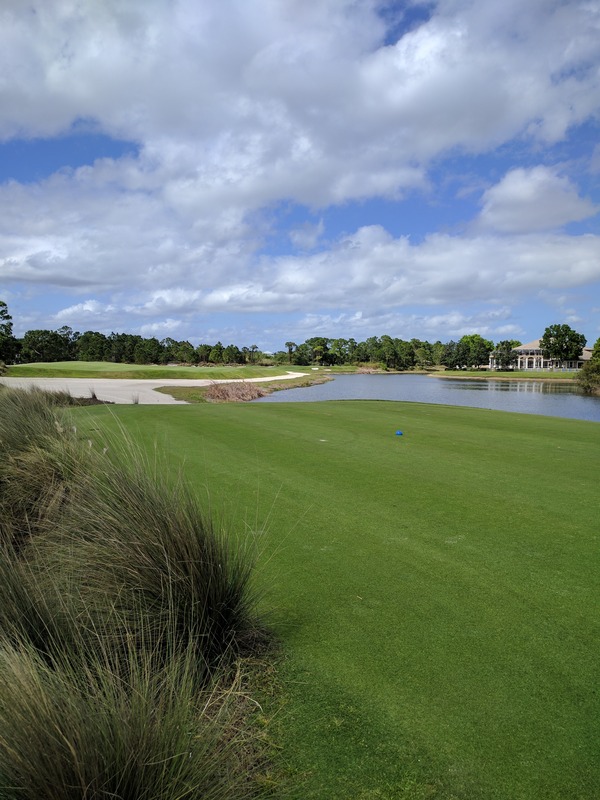 Remember me mentioning how 18th hole at Sawgrass doesn’t have a bunker between the grass and the water hazard to the left? That’s because Pete Dye loves designing courses with difficult, and especially memorable, 18th holes. Now most holes, by designers in general, if there’s a hazard or very difficult area on one side of the hole, leave the other side of the fairway open for tee shots to bail out on. But if the tee shot ends up on that safe side of the fairway, there can either be something like a viewing cover, or tough angle into the green to give some penalty for not hitting the fairway. Pete Dye doesn’t do that on the last holes. Biggest example here is Sawgrass 18. Everyone knows the hole from watching the Players every year. In case you don’t remember, here’s a picture from the PGA Tour’s site. Note the difficult stats on that page about the hole. Must hit the fairway, or very difficult to hit the green. pgatour.com‘s analysis gets credit. How about the 18th hole at the Meadow Valley course at Blackwolf Run. The guy teeing off is on one of the forward tees, but there are tees way back to make the hole play 458 yards. The hole is actually so difficult with the carry on the second shot that there’s a side green on the left side (hidden in the picture) so sometimes you don’t have to carry. The last time I played here in 2011 for the Wisconsin State Open, I missed the fairway to the right, said screw it, and barely made it over the water to the green and made par. 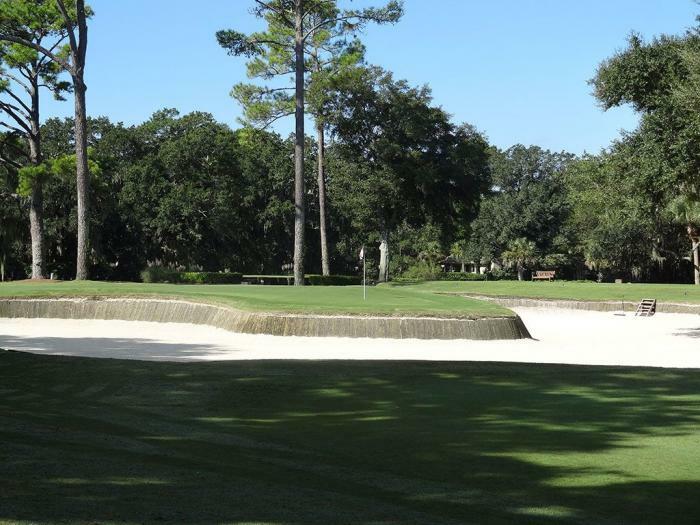 Finally for now, here’s the 18th hole at Dye’s course at Colleton River Club, a course I had never heard of before looking for Pete Dye course pics online. Bumps, mini bunkers facing you, fairway bunkers next to water, and a tough final hole. That’s Pete Dye for you.